Onboard the Ocean Adventurer (132 passengers) – A great all around ship run by the very experienced Quark Expeditions. I am suggesting the Deluxe Cabin, having undergone a major refurbishment in 2017, the Ocean Adventurer is a classic expedition ship with a comfortable feel and excellent public viewing lounges. The cabins are comfortable and modest with twin beds in all categories, however they have been remodeled to resemble a low- to mid-range hotel, like a Holiday Inn or similar. The expert education program is run by one of the most seasoned operators in the region. Onboard service is excellent with top-notch cuisine. Camping, kayaking, and snowshoeing are offered. Arrive in Ushuaia, a small town at the “end of the world” surrounded by rugged peaks and glaciers, and transfer with your group to your included hotel. Morning transfer to the ship where you are settled aboard the ship as you sail into the Beagle Channel to start your Antarctic expedition. Prepare for rough water, but hope for smooth sailing as the Drake is always changing. Spend time getting to know other travelers, listening to the presentations given by your Expedition Team, and exploring the ship’s amenities. 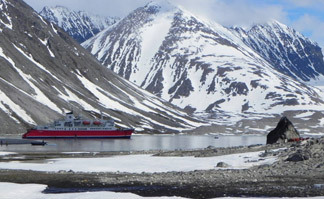 When the Antarctic Convergence is left behind, you will truly begin your Antarctic adventure. It is perhaps the first sight of land itself that is embraced as the true beginning of any Antarctic expedition. You can begin to appreciate why this region has long captivated the attention of explorers and travelers alike. Antarctica provides something new and unexpected every time it is visited, meaning your expedition will be unlike any other. Take Zodiac excursions from the ship to explore bays, channels and landing sites each day. With wildlife always at the forefront, visit penguin rookeries, scout for humpback and minke whales, and search for a number of the southern seal species including the cunning leopard seal. Shooting photographs from a Zodiac rewards with unique perspectives not afforded by land, and you’ll have several opportunities to capture the impressive landscape from angles that show off its striking beauty. With wildlife always at the forefront of guides’ minds, you may be able to photograph penguin rookeries and search for a number of southern seal species, including the cunning leopard seal. As you scout for whales, you may be fortunate to snap a shot of a surfacing humpback or minke. The majestic mountains of the Peninsula enchant as you scramble up snowy pathways to vantage points offering 360° views of your surroundings. One of these in particular, in Danco Island, gives the opportunity to visit a chinstrap penguin colony high up on a ridge. Choose between going for a mountain hike or spending time sitting quietly on a pebbled beach to enjoy the antics of curious penguins. If you’re feeling extra adventurous, participate in the Polar Plunge swim! Amidst the peaceful silence of Antarctica, noisy interruptions become indelible memories such as penguins squabbling over prized pebbles or the boom and crack of a calving glacier in Neko Harbour. Every day will be different, having been carefully crafted by your Expedition Team so as to educate about this wonderful part of the world. The journey back across the Drake Passage provides final opportunities to enjoy the crisp Antarctic air. Spend time on the deck watching for seabirds and scouting for whales, enjoy presentations by your Expedition Team or simply relax and reminisce about your experiences. Fuel Surcharge: Fuel surcharge may apply in the event of significant fuel price increases. All guests are required to have comprehensive travel insurance coverage. Due to the remoteness of the areas in this itinerary, travelers must have a minimum $50,000 of emergency medical coverage. Proof of coverage is required prior to embarkation. The shipping company will not be held responsible for delays due to force majeure. Any additional costs accrued will be the responsibility of the traveler. We strongly recommend at least $200,000 Emergency Medical/Evacuation coverage for Antarctic trips which includes coverage for cancellation, trip disruption, baggage and personal property. Other conditions may apply based on pre-existing conditions. Group transfer from the airport to the pre-voyage hotel on Day 1; one night pre-voyage hotel accommodation with breakfast in Ushuaia; group transfer from hotel to ship on embarkation day; group transfer upon disembarkation in Ushuaia from the ship to the local airport; shipboard accommodation with daily housekeeping; meals on board ship; photographic journal; waterproof expedition boots on loan for shore landings; use of walking poles; parka to keep; coffee, tea and cocoa available around the clock; miscellaneous service taxes and port charges; luggage handling aboard ship; house wine, non-premium domestic beer and soft drinks during dinner aboard ship (11/13/2018, 12/8/2018 only); gratuities (11/13/2018, 12/8/2018 only). Airfare; passport and visa expenses; government arrival and departure taxes; meals ashore with the exception of breakfast at the host hotel before embarkation; kayaking and camping; alcoholic and non-alcoholic beverages, except for ones mentioned as included; baggage, cancellation and medical travel insurance; excess baggage charges; laundry, bar, beverage and other personal charges; phone and internet charges; voluntary gratuity at the end of the voyage for shipboard staff and crew (12/4/2017, 2/28/2018 only) fuel surcharge may apply.